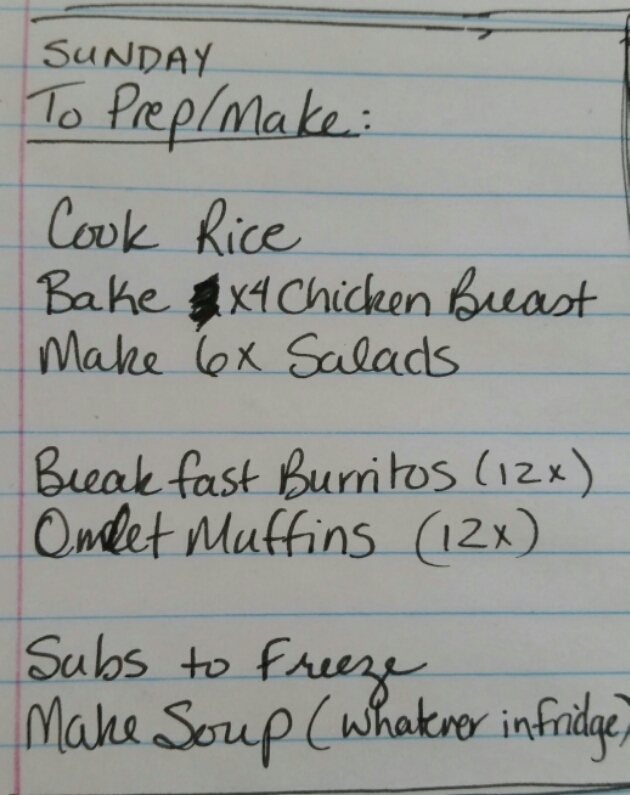 This week's menu plan came from the items I picked up on sale and the ingredients and meals we already have on hand. 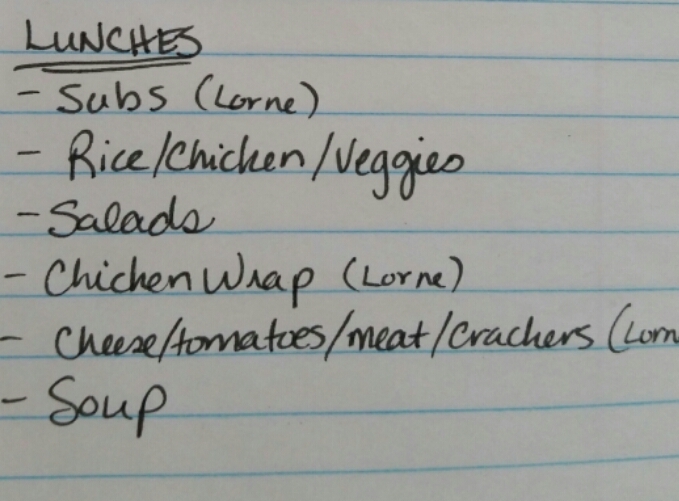 Each week I will share my menu plan showing what I had to purchase, and what I had on hand. Some items purchased will be used in freezer meal preparation, for use on other weeks. The way I meal plan may be a little different. I find it hard to stick to a meal plan when I assign days to the meals. 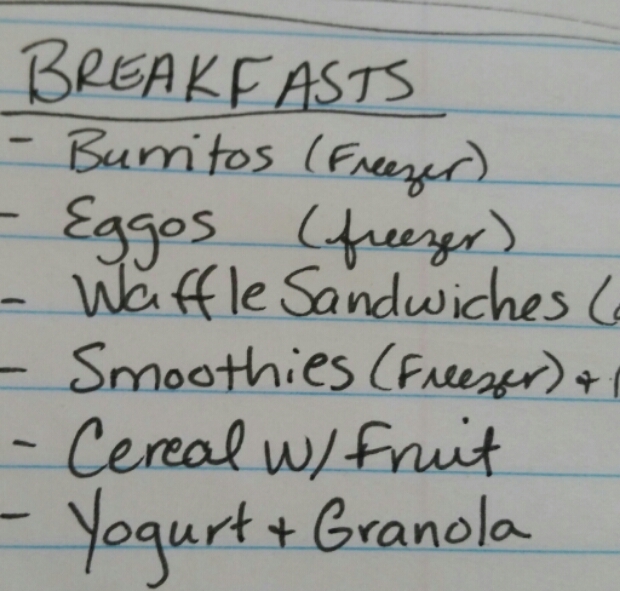 Instead, I make a list of meals, and then each day pick what we want to have based on how much time we have and what works with our schedules. Each week I spend time on Sunday prepping food for the week. Making salads, cooking rice, making up freezer meals, whatever needs to be done for that week's meals. 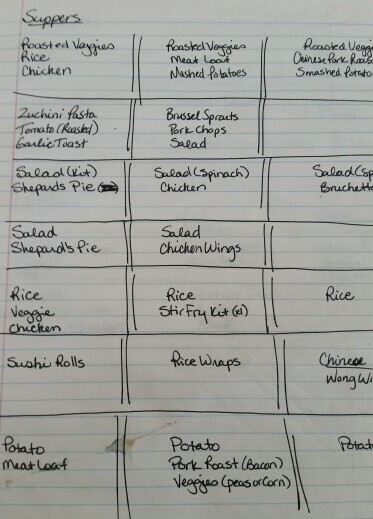 Here is what my meal plan can look like: This is the list I made when I cleaned out my freezer. There are meals included that are all prepped in my freezer. As we ate them, I crossed off what we ate. This is not my menu this week. Please find below the details of my menu and shopping for this week. Starting with what I have in the fridge, freezer and pantry, I then move on to the sales flyers. 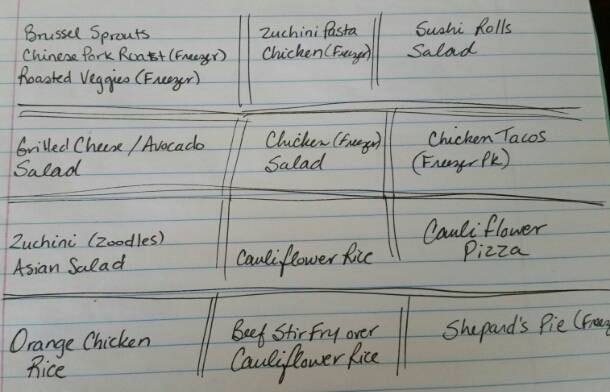 Each week I am planning for meals for that week and depending on sales, possibly meals for future weeks. Many of my freezer meals are for slow cookers and makes it very easy to just pop in and serve when done 4 to 8 hours later. As the week goes, I simply pick a meal and cross it off as we have it. I need to fill in a couple blanks here, but usually meat options are available in the freezer. These are more "reminders" to me. I need to do this so I add a little variety and use up the food we have on hand. Finally I make a list of the prep I need to do on Sunday. I like to do most of my prep the day I shop. If I buy veggies or meat and I just put it in the fridge, there is a better chance I will forget about it or not use it. So, I prep my food as soon as possible. Setting a certain time to do this each week is ideal. I hope this helps give an idea of what I do to waste less food and be prepared for the week. Having a very scattered brain most of the time, I find the weeks I can stick to doing this, I am much more productive and spend less time in the kitchen overall. Info above very helpful…when you have 2 kids with full time job and VERY LITTLE time to cook. Planning ahead is a must for me…but I seem to be running out of ideas….I think my brain is on overload. I’m interested in how you do your breakfast burritos and your cauliflower rice? Please share…thanks a lot.